Everyone told me shrinking an object or a person while maintaining that object’s original properties is impossible and they’re right. Planck’s constant prevents it. That means no Ant-Man, Atom, and no little subs like in Fantastic Voyage. Surprise. I’m only six-inches tall. 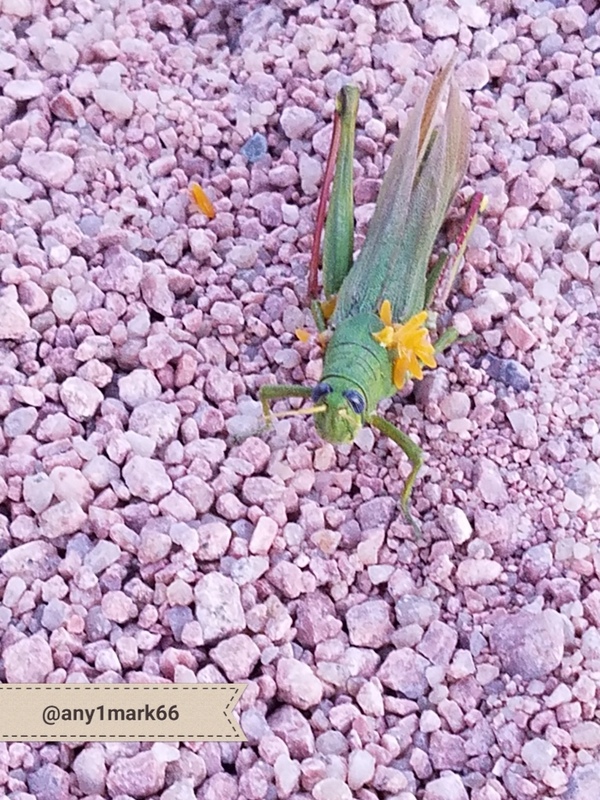 This grasshopper doesn’t know I’m standing in front of it because I’m not. I’m a hologram. My perceptions have been projected into a half-foot tall holographic matrix. Fascinating, except for one thing. I can’t disengage from the matrix. I’m stuck inside the projection of myself in my backyard. I wrote this for the FFfAW Challenge for the Week of November 28, 2017. The idea is to use the image above as the inspiration for crafting a piece of flash fiction between 100 and 175 words long. My word count is 175. However, as I very briefly explained, Planck’s constant prevents real-life shrinking (learn more at PhysicsForums.com and this BoingBoing.net article). However, if you could create a holographic matrix of the correct proportions and then project your perceptions into the construct, you would experience being small without actually being small (at least as far as my fake science goes). Just don’t let your two-timing wife know. Otherwise, you’ll end up like our hapless and nameless scientist. Now read Diminished: The Expanded Story. Poor guy! His wife is too smart for her own good. Great story James! Yes, he should have been paying more attention. Thanks. Great ending – it made me smile. Ingenious. I’m sure our hapless scientist isn’t smiling. Thanks. Well, now, if this advanced holographic projection is capable of interactive perception (which holograms cannot yet do), can it also perform physical operations in the manner envisioned in the StarTrek series? If so, perhaps our hapless hero might yet turn the tables on his faithless, murderous spouse. If he could only reach the controls or the circuitry, or attract the attention of someone else who could do so! Maybe the parents of one of the neighborhood children? I’m presuming the wife’s plan is for him to starve to death (probably by thirst) during her three-week absence, rather than to shut down or destroy the machinery that is keeping him trapped. That gives him at least a few days to try to find a rescuer. Failing that, might he achieve at least a Pyrrhic victory by leaving a note or a recording that reveals his wife’s treachery and gets the forces of law and order to execute her for premeditated cold-blooded murder? Maybe even his back-stabbing lab assistant Harold could be implicated as an accessory to the crime. If he could only get out of this, he could still get both of them for attempted murder! Yeah, but how! Stay tuned, readers, to see if James may be inspired to give our hapless hero a chance to survive, and maybe even to revenge this outrage. Can Justice triumph? One of the reasons we read fiction is the hope that it will do so, even if it sometimes falls short in real life. Yes, the plan is to leave him stuck in the holo-matrix chair until he dies of thirst. I had envisioned the hologram as not visible or solid (hence his question about how she could see him…special glasses perhaps), which means he wouldn’t be able to get anyone’s attention or manipulate any controls, but revising that premise is an interesting thought. Since a hologram is by definition an image, an invisible hologram is a contradiction in terms. Now, I suppose one could be constructed to be displayed at wavelengths outside the human visual spectrum, but there’s not much to be gained by doing so unless it is more than a visual projection. What it seems you are actually envisioning here is some sort of a covert agent that can transmit observations to a remote operator. If that is its sole capability, and the operator is somehow trapped inside some sort of operations console, then it would seem he has little recourse. Simply being tied to his chair wearing some sort of VR apparatus would seem a bit too obvious that foul play was afoot. I wonder how many scientific developments have been held back, or alternatively enhanced, by the distractions of marital relationships? One wonders about Albert Einstein’s wife. Well, wives, since he was divorced, later remarried, and then widowed. What a terrific concept and what a treacherous wife! Thanks Moon, and yes she is. That was evil.. but I loved your imagination! Thanks, Akshata. I hadn’t planned to write an expanded version of this tale, but then PL’s suggestion stuck in my brain and I’m in the process of editing it now. Please stand by. Thanks. I wrote an expanded story that fleshes things out quite a bit more including what happens to everyone at the end.